UPDATE: This contest is now closed. Congratulations to this week's winners, Grace Ann Pierson and Carol Jarrett! If you are Grace Ann or Carol, please see our reply to your comment below to find instructions for claiming your prize. Thank you to everyone who entered, and keep reading the Homecoming Insider newsletter for more fun giveaways! Welcome to this week's Homecoming Insider giveaway! 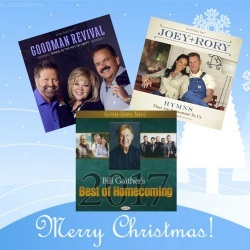 Enter now for your chance to win a prize package including CDs from Goodman Revival and Joey+Rory, as well as Bill Gaither's Best of Homecoming 2017! To enter, simply comment below and let us know why you'd like to win this prize package. Only one comment per person, please! The deadline for entering is this Monday, December 26, and our TWO winners will be randomly chosen and posted to this page no later than Tuesday, December 27, 2016. IMPORTANT: If you are the winner, we will notify you ONLY by posting your name on this page and announcing it in the next Homecoming Insider newsletter. It is your responsibility to check back here on or after Tuesday, Dec. 27, to see if you are the winner and get instructions for claiming your prize. If the winner has not claimed his or her prize within two weeks, it will be forfeited and may be featured in a future giveaway. Tanya Goodman Sykes, Michael Sykes and Johnny Minick have joined together to capture the musical styles and heritage that have endeared them to countless people around the world. Known for their legacy as part of the legendary Happy Goodman Family, in addition to their own national awards and familiarity among the Gaither Homecoming family of artists, these three individuals have put their signature twist on some of gospel music's timeless hits and Goodman classics with their recording debut, Songs in the Key of Happy. Before Joey Feek's passing, she wanted to record an album of her favorite hymns. This acoustic-driven collection showcases the authenticity and rich, warm vocals of Joey+Rory, who found strength during hard times through these timeless songs of the church.